ChequePRO is a Multi-Company, Multi-User, Multi-Bank Account, Multi-Check Book, Multi-Currency and Multi- Language software. ChequePRO has a very strong growing community of satisfied users. They have users from all over the world enjoying the simplicity and comfort of managing their payment, ranging from a single owner company to Corporations, Banks, Auditing Firms, Embassies, etc. ChequePRO has a very strong and Growing community of satisfied users sharing information. Their Mission at ChequePRO is to move forward by building and nurturing the relationship with their customer through commitment leading to customer delight. Built on the ideology of utilizing existing resources ChequePRO is built on the ideology of utilizing existing resources. User can use any existing printer in their office. Most of the printer type are supported laser Printers, Deskjet Printers, Inkjet Printers, All-In-One Printers. Help's To Build cheque Layout To Fit Your Bank Cheque ChequePRO has a built in state of art cheque alignment engine, cheque image can be imported as well as tons of other parameters can be edited. Eliminates Spelling Mistakes, Differences between Amount In Figures & Amount In Words. ChequePRO just needs the user to select the payee name and enter the amount to be paid to the payee, rest parameters required to prepare the cheque are auto filled like date, "Not negotiable" "Account Payee Only" stamp, Conversion of figure to amount in words. Cheque’s Printed from ChequePRO cannot be Tampered. ChequePRO has a built in feature for adding **** before and after the payee's name, amount and amount in figures, thus disabling the ability to amend or modify the payee's name, amount or amount in figures after the cheque is printed. 100's of bank templates which has images and alignment of various banks from various countries. Yes ChequePRO includes 100's of bank templates which has images and alignment of various banks from various countries. Users can easily import bank images and set alignment according to there printer with a very simple cheque alignment engine. Historical record on issued cheque, Bank Statement, Management reports, Reconciliation, etc. Instantly generate business intelligent reports. These information is strategically stored in database so that a simple search can generate the required information instantly. Export reports to Adobe, Excel, Word etc for your meetings or presentations or general financial review for any particular client or vendor or bank. Import multiple Cheque information to be printed using a Predefined spreadsheet format containing - Date, payee Name, Amount, Description. Is one of the central principles of authorization in the Information Systems of financial organizations. The principle of maker and checker means that for each transaction, there must be at least two individuals necessary for its completion. While one individual may create a transaction, the other individual should be involved in confirmation/authorization of the same. In this way, strict control is kept over system software. User can add signature to cheques. To create a signature image, sign on a piece of paper and then scanning it and save the scan to a file. Your signature file is in the correct file format. ChequePRO accepts almost any image file format, including BMP, JPEG, PNG, and TIFF. The signature can be aligned using the built in WYSIWYG alignment engine. 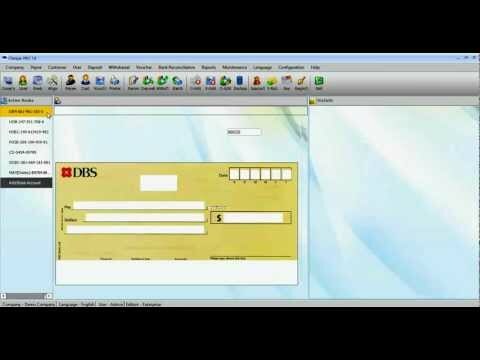 Cheque printing software - How to issue a cheque from ChequePRO. ChequePRO is a simple to use software, with just couple of clicks you are up and running, Any person preparing cheque would be able to use and love ChequePRO instantly. Its Typo Error Free, Tamper Proof, Has a WYSIWYG Built-In Check Alignment Engine, and much more. ChequePRO is a Multi-Company, Multi-User, Multi-Bank Account, Multi-Check Book, Multi-Currency and Multi- Language software. ChequePRO has a very strong growing community of satisfied users. We have users from all over the world enjoying the simplicity and comfort of managing there payment, ranging from a single owner company to Corporations, Banks, Auditing Firms, Embassies, etc. Q. If I buy the Lite Edition now, can I switch to the Professional, Enterprise or Ultimate Edition later? Yes. If you buy the Lite Edition you can switch later to the Professional, Enterprise or Ultimate Edition . For example, the cost to switch to the Professional Edition after the Lite Edition has been purchased would be Rs. 3500. Q. Which printers are supported? Q. Do we need special cheque stationary? Q. Does ChequePRO include any bank Cheque Templates? Yes ChequePRO includes 100's of bank templates which has images and alignment of various banks from various countries. Users can easily import bank images and set alignment according to there printer with a very simple cheque alignment engine.